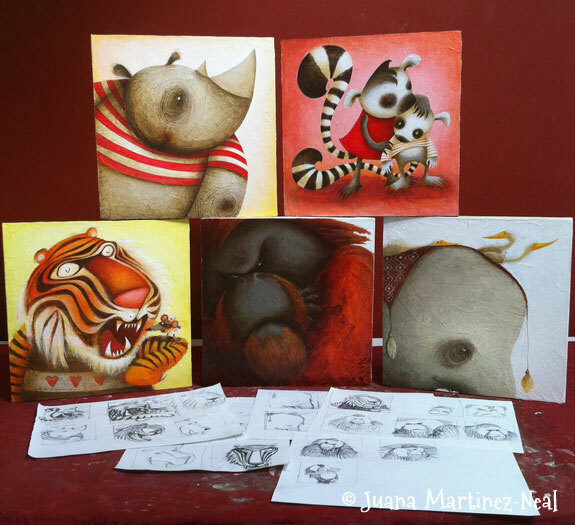 Now, what’s more fitting than a Zoo, wild animals and a children’s illustrator work? Nothing. So when I was approached to donate some artwork for the Silent Auction, I immediately said yes. Which one is my favorite? The orangutan. Second Favorite? The elephant. Something about the emotion on those pieces is completely opposite and attracts me so very much. Both quiet but completely different. And I got to add a bit of cultural flavor on the elephant illustration. Overall feeling with this project, pleased. You can learn more about Rendez Zoo and the Phoenix Zoo here. Son todos una ricura… no sé cuál me gusta más! I love love your art works. They are amazing! I love their textures, and color combinations. You did a great job designing each one of them. Bravo to you!!!! !